Abstract. The usage of time series of Earth observation (EO) data for analyzing and modeling surface water extent (SWE) dynamics across broad geographic regions provides important information for sustainable management and restoration of terrestrial surface water resources, which suffered alarming declines and deterioration globally. The main objective of this research was to model SWE dynamics from a unique, statistically validated Landsat-based time series (1986–2011) continuously through cycles of flooding and drying across a large and heterogeneous river basin, the Murray–Darling Basin (MDB) in Australia. We used dynamic linear regression to model remotely sensed SWE as a function of river flow and spatially explicit time series of soil moisture (SM), evapotranspiration (ET), and rainfall (P). 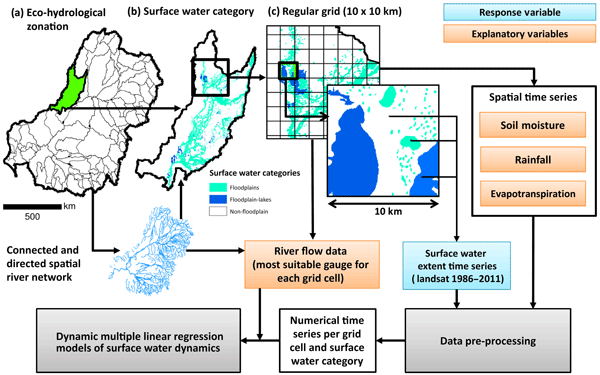 To enable a consistent modeling approach across space, we modeled SWE dynamics separately for hydrologically distinct floodplain, floodplain-lake, and non-floodplain areas within eco-hydrological zones and 10km × 10km grid cells. We applied this spatial modeling framework to three sub-regions of the MDB, for which we quantified independently validated lag times between river gauges and each individual grid cell and identified the local combinations of variables that drive SWE dynamics. Based on these automatically quantified flow lag times and variable combinations, SWE dynamics on 233 (64%) out of 363 floodplain grid cells were modeled with a coefficient of determination (r2) greater than 0.6. The contribution of P, ET, and SM to the predictive performance of models differed among the three sub-regions, with the highest contributions in the least regulated and most arid sub-region. The spatial modeling framework presented here is suitable for modeling SWE dynamics on finer spatial entities compared to most existing studies and applicable to other large and heterogeneous river basins across the world. 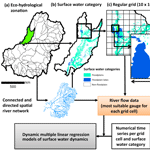 How to cite: Heimhuber, V., Tulbure, M. G., and Broich, M.: Modeling 25 years of spatio-temporal surface water and inundation dynamics on large river basin scale using time series of Earth observation data, Hydrol. Earth Syst. Sci., 20, 2227-2250, https://doi.org/10.5194/hess-20-2227-2016, 2016.